A construction-to-permanent loan is a type of loan that converts to a mortgage after originating as a construction loan. This type of loan is perfect for home buyers who are building a new house because many people don’t have the required financing to obtain construction funding alone. Construction-to-permanent loans require one application and closing, including one-time closing costs. This is easier than having to apply for and pay closing on a loan for construction, then apply for and close a mortgage a few months later. These locks limit the interest rate on the permanent loan so borrowers don't end up paying an obscene amount of money if rates spike. Interest on your construction-to-permanent loan may be tax deductible. 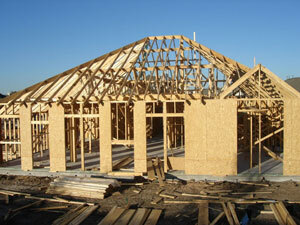 Sales tax on building materials is deductible using IRS Form 1040, Schedule A. This is a great loan type if you want to customize your own home, so long as your plans size up to current building codes. The cost of building may end up being cheaper than buying an existing home in the area, and you’ll be able to choose where the home is built according to land zoning laws. If you take out a construction-to-permanent loan, you don’t have as much leeway to negotiate the interest rate on the permanent mortgage. This is because you are already locked into the loan, no matter what the later rate will be. You can always refinance your loan to get a lower rate, however, so it’s important to make sure you choose a refinancing lender who will give you the lowest interest rate and won’t take advantage of you merely because you’re locked in. Additionally, you’ll have to decide on the type of loan (i.e. fixed-rate) before it converts to a permanent mortgage. When you take out a construction-to-permanent loan, you are assuming that the house will be built well and will present little to no financial hardship for you. However, if this is not the case, you are still locked into this specific loan and house. Therefore, you want to make sure that you know and trust your builders to build you a quality home. A good way to gauge this is to go to several model homes to see if you like the overall quality. Overall, there’s more collaboration with this type of mortgage loan than any other type of mortgage loan. Due to the high-risk nature of building a home and committing to a borrower, there is a lot more documentation required for a construction-to-permanent loan than another type of regular mortgage loan. In addition to the the usual bank statements and tax information, builders must provide property and lot information as well as detailed building plans. Find more information on construction loan paperwork and processes here. Annual Percentage Rates (APR) for construction-to-permanent loans are often higher than those for regular loans. This can present a problem for those who are struggling with savings accounts.